Troedyrhiw Holiday Cottages01239 811564work Self-cateringTroedyrhiw Holiday Cottages are situated on a 13 acre smallholding in a beautiful secluded wooded valley near Cardigan in Ceredigion west Wales, with its own stream running through the grounds. The converted slate farm buildings provide luxury self catering accommodation in five cottages sleeping two, three, four, six and eight people and can accommodate up to 23 people, making them ideal for larger groups. All the self catering accommodation is furnished to a high standard and has been awarded with five stars by Visit Wales. The holiday cottages are located at the end of a road half a mile long where there is no through traffic, providing a safe haven for children to play safely. The accommodation is children friendly with many animals for children to see, including Blossom and Ben the miniature Shetland ponies, Gertie and Goldie the Kune Kune pigs, Emily, Ember, Sienna, and Ellie the Pygmy goats, chickens, ducks and Blue, Meg and Bethan the friendly dogs. Situated in a Coastal location near Cardigan in West Wales, Troedyrhiw is ideal for a relaxing holiday break. The cottages are just five miles from the beautiful National Trust beach of Mwnt and the Ceredigion Marine Heritage Coast, which is home to an abundance of marine life including bottlenose dolphins, harbour porpoise, grey seals and many sea birds and fish. The holiday cottages are well placed to explore the local area of West Wales, Cardigan Bay, the Pembrokeshire Coastal Path and the Pembrokeshire National Park and for more active visitors, Troedyrhiw is perfectly located to explore Ceredigion and West Wales on foot, mountain bike or even horseback! 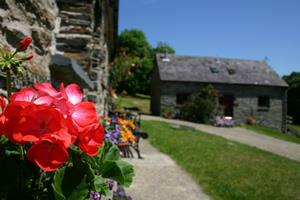 The Coach House and The Stables cottages have a large decking area with seating to enjoy the fresh air and sunshine. The cottages are surrounded by well kept lawns which are perfect for barbeques in warmer weather and all the cottages have woodburners, making them a perfect way to unwind and warm up with a glass of wine after an invigorating walk on the beach or nearby mountains! There are beautiful views towards the Preseli Mountains in the Pembrokeshire National Park just a short walk from the holiday cottages, which help to provide the inspiration to explore Ceredigion and West Wales! Troedyrhiw Holiday Cottages are situated on a 13 acre smallholding in a beautiful secluded wooded valley near Cardigan in Ceredigion west Wales, with its own stream running through the grounds. The converted slate farm buildings provide luxury self catering accommodation in five cottages sleeping two, three, four, six and eight people and can accommodate up to 23 people, making them ideal for larger groups. Approx 5 miles north of Cardigan 1 miles off the main A487 Cardigan to Aberaeron road. Access statement for each cottage available upon request.